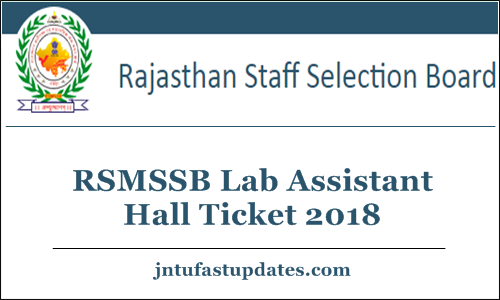 RSMSSB Lab Assistant Admit Card, Exam Date 2018 : Rajasthan Subordinate and Ministerial Services Selection Board (RSMSSB) is all set to organize the lab assistant written test soon in October/ November. The test is going to be held in many places across the Rajasthan state. This time thousands of hopefuls are competing for the post of the lab assistant. Hence the competition is high, the aspirants appearing for the test must prepare well to crack the examination. Aspirants will be shortlisted on the basis of merit. Hence the hopefuls must focus to get good merit in written test and interview rounds. The applicants who are going to attend the RSMSSB Lab assistant written test must download the hall ticket beforehand to attend the test. From the hall ticket, candidates can check the details of their examination centers, timings of the examination, exam date, and other details. The competitors are informed to download the hall tickets and carry the hard copy of it to the examination as a must. The examination officers will thoroughly check the hall ticket of the candidate before allowing him/her to the examination. The candidates can get the admit cards from the RSMSSB portal, rsmssb.rajasthan.gov.in soon. Rajasthan Subordinate and Ministerial Services Selection Board (RSMSSB) is the Rajasthan state government organization that works for various Subordinate and Mineral services. The organization releases various notifications to recruit suitable candidates into various posts. Notification for 1200 lab assistant posts has been released by the organization recently. The organization accepted the applications from eligible and interested aspirants from 14th June to 13th July. Hopefuls dreaming to get Rajasthan state government jobs and having the suitable eligibility have applied within the scheduled application dates. As the screening will be done through written test and interview rounds, candidates applied for Rajasthan lab assistant posts must get ready to face the selection process. As I mentioned before, candidates will not be allowed to proceed with the examination without showing the admit cards. Hence the hopefuls who are going to appear for the RSMSSB Lab Assistant written test must download the admit card from the official portal, rsmssb.rajasthan.gov.in. The hall ticket/admit card will be accessible to download before 10 days of the examination (tentatively). The download link will be activated on the official portal. The applicants are requested to check the official portal regularly to check the hall ticket link.